GOT BURNED? GET THE RIGHT RELIEF. These minor burns damage the first layer of skin and cause mild pain, redness, swelling and increased sensitivity. 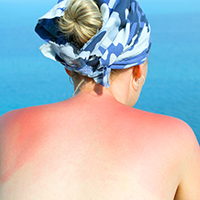 These burns typically heal within 5 to 10 days, with the pain subsiding after the third day. 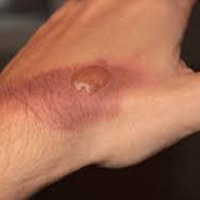 Painful blistering and deeper reddening of the skin are the most noticeable indications of a second-degree burn, signaling deeper damage into the second layer of the skin. The red area often turns white when pressure is applied. 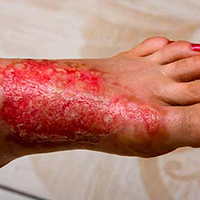 Second-degree burns usually heal in less than 2 to 3 weeks. If a second-degree burn is larger than 3 inches or covers the hands, legs or groin areas, seek medical attention immediately. 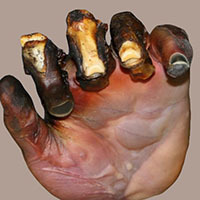 Damage extends to the third layer of skin, which appears white or blackened. The charred skin may even go numb, which means your nerves may be damaged. Scarring is likely and healing can take several months. For third-degree burns, call 911. Critical damage to all layers of the skin as well as charring of muscle and bone make fourth degree burns extremely dangerous. Victims of fourth-degree burns experience numbness, caused by shock and nerve damage. For fourth-degree burns, call 911. TRUSTED BY THE MEDICAL COMMUNITY. In 2000, clinical trials found ALOCANE® Maximum Strength Emergency Burn Gel to be a powerful treatment for first- and some minor second-degree burns. For individuals suffering from Radiation Dermatitis (commonly caused by radiotherapy), we created a prescription variant called ALOCANE Plus. Since these findings, ALOCANE® has been actively involved in burn treatment and trials at burn centers, hospitals and even tattoo removal centers across the nation.